There are others I could add to the list, but those are the ones that instantly come to mind. The transformation, and that's what it is, began five months ago, March 25, 2013 to be exact. That's the day Christina and I removed sugar from our diet. Within minutes of making the decision, we determined that in addition to throwing away every box, can, or package that contained added sugar, we needed a guide book. I remembered a friend, years ago, recommending Sugar Blues. I checked it out on Amazon and found it wasn't available in a Kindle version, but now there were many more choices to pick from. I downloaded a number of samples, read each, and discarded them because my gut told me they weren't right. I continued the search for a no sugar guidebook and that's when I found Sweet Poison and met David Gillespie (photo). I didn't actually meet him. David lives in Australia, I live in the U.S., and the closest I've been to Australia was in 1968 when I met a group of Aussies in Vietnam. They were temporarily stationed near my unit, and they issued a standing invitation to us to hop a ride on their weekend resupply plane. A lot of my buddies did, unfortunately I didn't. Now, another Aussie, has given me the key to transform my health, and I didn't miss this invitation. David isn't a doctor, or nutritionist, or dietitian, which, to be brutally honest, I found refreshing. In the back of my mind, I'm convinced that is the group that led us into this health quagmire. David is a lawyer, and in all honesty, we all know they've led us into a few dismal swamps, but not swamps that are health related. So I downloaded a sample of Sweet Poison and discovered that David was a fat lawyer when set out on a journey to discover the cause and the cure for obesity–eighty pounds south of the obesity line. When I read that, my gut said, 'this is the guy to read'. 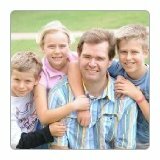 Then I looked at David with his kids (photo posted above) and my mind agreed with my gut. This guy has figured it out. In the almost sixteen years we've been married, we've made a couple of major dietary shifts that didn't work out. No sugar is a whole different ball game. It isn't a diet, it's a new way to eat–forever. 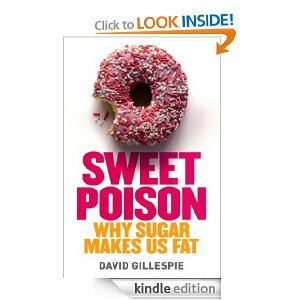 David says sugar is addictive, and a lot of experts agree with him. If that's true, I can personally attest to the fact that it is an easy one to break. That doesn't mean that going "no-sugar" is easy. For starters, you've cut your choices by at least 95%. On the other hand, think of all the time you spend trying to decide what to eat. You won't be doing that anymore. And you won't be counting calories. But you will be reading labels. But most important, you will be getting well. The best example I can give is the sinus condition I've had since 1968. I've not missed a single year without a major "episode." And, over the past six or seven years that has escalated from one to two and sometimes three annual episodes, each running at least four weeks. When we went no-sugar, I was using a nebulizer daily to keep my sinus issues manageable. A week after we began no-sugar, I realized I hadn't used it a single time. Now, five months later, I still haven't used it and I've not had a single issue with my sinuses. When I graduated from high school, I weighed 172 pounds. Before the year is over, I'll be at that weight again. Do I miss sugar? Nope. After a couple of weeks without it, I realized there are still a lot of things to eat and enjoy. I've come to believe that sugar consumption is more habitual than addictive. It takes commitment to break a habit but, to use one of Joe Pike's favorite expressions, "If it were easy it wouldn't be fun." And, it is just plain fun to feel better than I've felt in years and years. Its fun to come home from a run and tell Christina, "I nailed that bad boy." And it's fun to live without a chronic health condition that was rapidly taking over my life. Running without sugar has no downside.